Many of the best homeowners hear the words hardwood flooring, and they immediately think expensive. In the past, if you wanted to put down a nice floor type, you could possibly spend a great deal of money. That’s no longer the case. There are a lot of different opportunities that you can explore to get the most for your money when it comes to flooring solutions. If you are in serious need of inexpensive hardwood flooring, you will be surprised by what you could do to drop the price down a bit. Saving money on home improvement is not a hard thing to accomplish. The following ways you can save money on flooring will highlight more than just inexpensive hardwood flooring. It details how you can drop the price on your floors, even if you have expensive taste. You’ll be surprised but how simple it is to eliminate high prices fast. Before you get moving forward with any flooring. Make sure that you understand that there’s a difference between hardwood floors and laminate wood flooring. You may search for options online and run into sites that use the terms interchangeably. That’s not a good thing. The quickest way to understand this is to know that one is synthetic and the other is made directly from trees. Hardwood flooring is made from wood, even if it comes in panels. Laminate wood flooring is often synthetic and layered, treated, and then made to snap together with relative ease. This is low cost, durable, and comes in a variety of styles, but it is not the same as hardwood. Do not be fooled by this. Now, if you want laminate, you can save money, it’s easier to install, but it is NOT hardwood in the sense that you may think it is. Even if someone uses the term, remember, it’s most likely not made of real hardwood. As a rule of thumb, experts suggest purchasing unfinished hardwood options. This means that you’ll have to finish the planks on site, and that could allow for an improved overall look and feel, as well as customizations that you want to get done after the fact. Prefinished or factory finished solutions will cost you more, and in some instances, can raise the price point 2:1 per square foot. If you’re trying to save money, then unfinished is going to be a little cheaper up front, which is something that could help your overall budget. Measure the area of your home that you will want to cover with hardwood flooring. 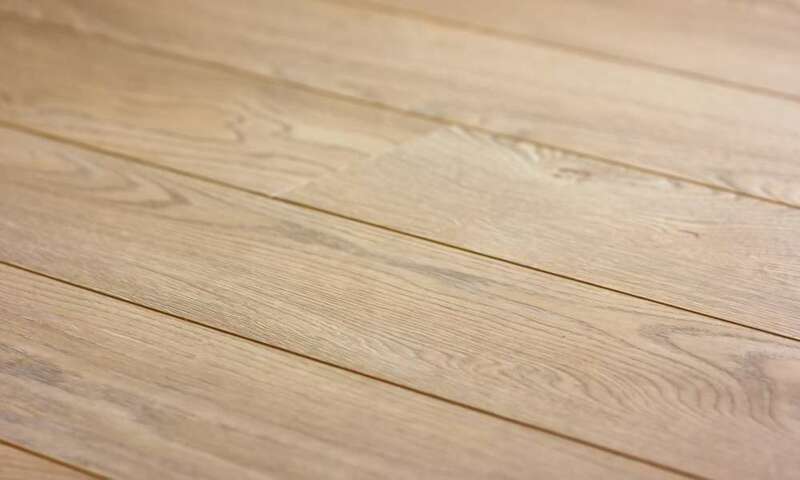 Make sure that you are exact, with a little wiggle room for extra, and then buy your floor in bulk. You can do this and purchase materials directly from the manufacturer or through hardware stores. Your goal is to cut out the markup that comes with getting your materials and labor from the same source. There are some companies and contractors that can save you money on materials, but chances are, if you’re savvy, you can get lower prices by purchasing the flooring materials in bulk up front. The key is to take the right measurements, because if you’re wrong on that, you could end up either under- or overbuying. Amidst the best inexpensive hardwood flooring options going right now comes this solution. Recycled flooring solutions can help you not only save money, but also go green at the same time. If you are concerned with the environment, then consider using recycled and reused options. There may be infractions, discoloration, and other minor cosmetic issues with this solution, but overall, the price may be a lot less. You will need to shop around, as not every company carries this. You also need to have exact measurements and be ready to either purchase surplus, or combine two different orders and try to match the colors and style. Look for wood liquidators in your area, and ask around for surplus materials. You’ll be surprised by how many construction projects, even in the home improvement sector leaves companies with extra flooring. Just one overbuy could leave a company with enough flooring to cover a full home. This may take a bit of work to call around and figure out an outlet that has this solution for you, but in the quest to save money, finding surplus can very well give you a great deal on materials. Aside from seeking out inexpensive hardwood flooring, saving money can be as easy as getting your hands a little dirty. Pulling up your existing floor is going to take someone a bit of work. You can either pay someone to do this, then install your flooring, or you could do it yourself. It’s not recommended that you do this on your own if you have a bad back, and you don’t have any tools. However, if you have no back concerns, and you are willing to put in a little sweat, this is going to save you a lot of money. The demolition part of construction is not only fun, it’s cost effective. If you pull up your own flooring, you can get a professional to install your hardwood, and of course, save a lot of money. At the end of the day, you’re going to find that there are a lot of options to explore when it comes to inexpensive flooring of all types. You can find low-cost solutions with the above tips and tricks, and a little patience. Make sure that you set aside a modest budget, and consider doing a little of the work yourself. Once you have your budget, and you’re committed to doing a bit of the demo work, you can purchase solid wood floor at around $1 a square foot. That’s right, the cheapest of solutions could only be around $1 per square foot, with some discounts based on the size, style, brand, and more. If nothing else, remember to take your time when looking for inexpensive hardwood flooring. If you use haste, you are going to spend more than necessary, guaranteed.